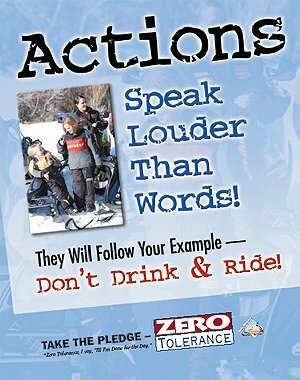 MSA is a non-profit, volunteer organization dedicated to the success of snowmobiling in Michigan. MSA facilitates the over $10 million dollar snowmobile program, that is funded 100 percent by you – the snowmobiler. By joining MSA, you have greater legislative power. MSA is your voice in Lansing and Washington D.C. — monitoring regulations and proposed legislation that will affect snowmobiling. Make no mistake, without MSA’s involvement, continued monitoring and influence, you wouldn’t have a trail system! To further your voice in Lansing, MSA has a full-time legislative consultant and a full-time office staff, all working on snowmobile-related issues — locally, statewide and in Washington, D.C.
MSA has a large presence on the Snowmobile Advisory Workgroup (SAW), a state board that makes recommendations on our trail program..
MSA continues to promote a positive image, proving that snowmobilers are dedicated to charity work and are strong environmentalists. Annually, MSA volunteers raise over $600,000 for charity, foster partnerships with other land user groups and participate in environmental cleanups and tree plantings. Since the inception of MSA, 2,500 miles of quality trail have been added to our state trail system that now boasts of over 6,500 miles of marked and groomed trails and over 30,000 more miles of undeveloped trails in state and federal forests where snowmobiling is permitted. 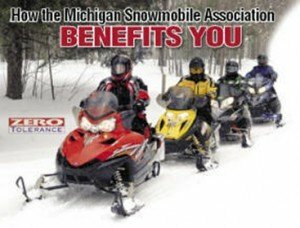 By joining MSA, you will also receive six issues of the Michigan Snowmobile News, designed to keep you informed and provide you with tips, trip destination information and coverage of sponsored events. Our recreation is under constant attack. It is only through unity and the proven strength that an organization like MSA has that snowmobiling will continue and grow. We must protect and preserve our chosen recreation.